The high speed digital printer provides users with high uptime and reliability, exceptional performance, superior accuracy, long printhead life and low maintenance needs. Nearly 300 customers and journalists attended the open house to experience the BOLT in action. The BOLT provides an innovative, low maintenance and quick start up recirculation printhead. Due to its high performance ink delivery system the BOLT has throughput speeds of up to 90 metres per minute (more than 8,000 square metres per hour) at a 600 x 600 dots per inch (dpi) resolution. It features high-end greyscale imaging in drop sizes from 5 to 30 picolitres and offers premium-quality 600 x 4,800 maximum-dpi resolution printing. This allows customers to address the full range of design needs. The printhead has been developed in partnership with a leading printhead manufacturer and will be available exclusively for EFI Reggiani. The printer’s contactless wiping system extends printhead life and quality. In addition, it has an assisted alignment system for its test calibration scan unit and features extractable printing beams for easier maintenance. Due to EFI’s expertise in colour management and flexible colour configurations, customers can reproduce a wider range of work including designs that feature plain colours, geometric patterns, fine lines, deep blacks and smooth gradients. One or more analogue printing stations, which may be easily connected as an optional feature can be integrated into the digital printer for special effects. The BOLT features an EFI Fiery DFE with RIP and colour management technologies that runs on Fiery XB bladed hardware for maximum performance. Fiery technologies for the printer offer textile printing businesses the ability to produce challenging jobs with the finest detail, demanding colours, smooth gradients and more. EFI colour scientists developed special algorithms and custom screening for this Fiery system to deliver vivid print results, including high saturation without losing detail and superior colour even when using the fastest print mode. Fiery technologies for the BOLT also include a 1 year subscription to EFI Fiery DesignPro, a powerful textile and fashion design suite that runs inside designers’ Adobe® Creative Cloud® applications. Fiery DesignPro lowers the time required to create colour books, repeats, colourways and prepare files for production to minutes instead of hours. Together, the BOLT single-pass printer and Fiery technologies tackles key market trends as customers face pressure for quicker time-to-market, quick fashion cycles, shorter print runs and more customisation. In the last 15 months, the EFI team has developed a renewed range of digital scanning printers with cutting-edge technologies. EFI launches a new model every quarter to provide customers solutions to meet their requirements. 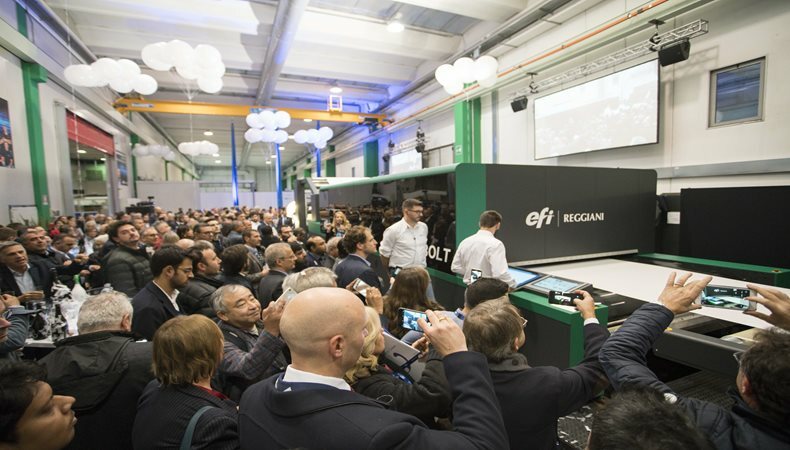 The list of EFI Reggiani advancements includes two recent launches: the COLORS digital printer that has up to 12-colour printing and the TERRA pigment ink with binder solution that features in-line polymerisation, a process that speeds up customers’ printing with one of the industry’s greenest production technologies.